Riverside Local School District is pleased to announce that starting with the 2019-2020 school year, all elementary schools in the District will have all-day kindergarten at no additional cost to parents or guardians. *To be eligible for kindergarten, children must be 5 years of age on or before September 30, 2019. *Students will be screened during the first month of school by the building health aide/nurse. *Speech/language screenings will be done by the speech therapist in the elementary building during the first month of school. The following documents will need to be scanned and uploaded during Online Registration. If you do not have the ability to scan and upload documents, you can still complete the Online Registration, however these documents will have to be handed in at the Board Office. c. Please refer to our district website at www.riversidelocalschools.com for a complete list of residency requirements. 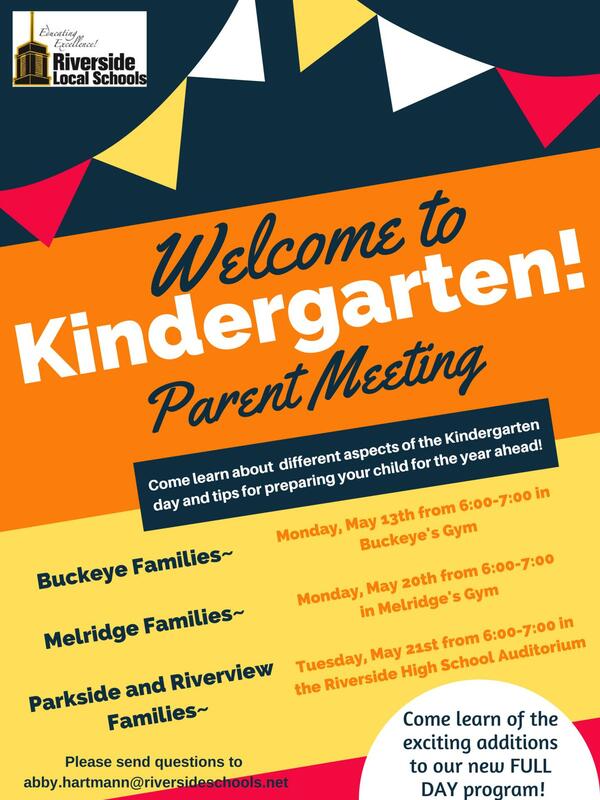 The District's Literacy Coordinator, Abby Hartmann, will host Kindergarten Parent Informational Meetings in May as a way to welcome new family members to the Riverside Local School District. The parent meetings will offer expectations for the kindergarten school year along with tips to support their child academically before their first year of school.